The soft top portions of organic Moso bamboo shoots, cut into 6-7 cm pieces. Can be used in stews, bamboo rice, soups, and stir-fry. 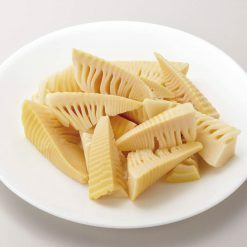 These packs of organic Moso-variety bamboo shoots contain only the top 6-7 cm of the plant, so that you don’t need to worry about cutting off the tougher lower portions. If you wish to cut off only small sections of the soft tips to use, leave the bamboo shoots out at room temperature for a little while and then cut to desired size before refreezing unused portion. Bamboo shoots can be used in stews, bamboo rice, stir-fry, and soups. The average length of uncut Moso bamboo is about 25 to 40 cm, and the average thickness is 15 to 25 cm. The average weight is 2 ~ 4kg. The interior of Moso bamboo shoots is hollow, the skin has hairs, and the flesh is a pale yellow. Moso bamboo is native to China and Taiwan, and is a highly useful plant. Not only can its shoots be used in cooking, but its mature form can also be used in the creation of flooring and furniture. Because Sugarlady’s organic bamboo shoots come in easy-to-use ziplock bags, desired portions can be removed without needing to defrost the entire bag. 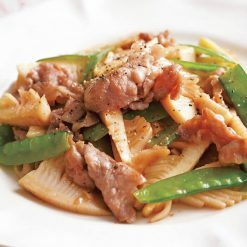 To eat with sauce, boil the bamboo shoots briefly before use. Bamboo shoots can also be used as a component of stews, bamboo rice, stir-fry, and soups. Bamboo rice, or take-no-ko gohan, is an easy-to-make traditional dish that showcases the unique flavor of bamboo shoots. To make bamboo rice, simply mix rice with your favorite seasonings, and then steam it. When the rice is nearly done, add the frozen bamboo shoots, which will thaw to perfection as the rice finishes cooking. This product contains organic bamboo shoots (Moso bamboo) China. Origin of ingredients: bamboo shoots (China). Prepared and packaged in China.